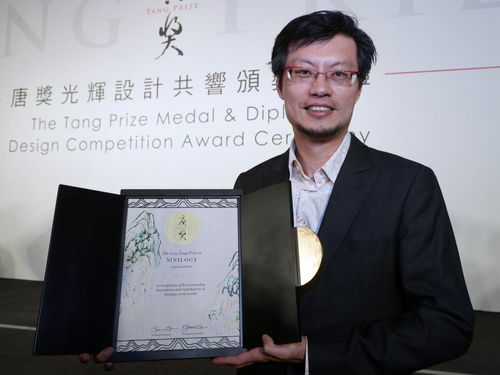 Taipei, Sept. 6 (CNA) The concept behind the design of the certificates for the winners of the Tang Prize is to convey excellence through traditional Chinese symbols, the designer Huang Wei-han said Saturday. "I wanted to combine modern tastes with a generally traditional and serious design," the 42-year-old Taiwanese told an audience of about 200, as he described the aesthetics of the project to design certificates for the international academic award that was established by Taiwanese entrepreneur Samuel Yin. Huang said he used silk and Chinese embroidery to create the diplomas for the four Tang Prize categories -- rule of law, biopharmaceutical science, sinology and sustainable development. He said he used simple lines that depicted the sky, Earth, mountains and water to embody the spirit of the four categories, respectively. For instance, the diploma for the rule of law winner shows colorful clouds across the sky, which suggests an era of peace and prosperity, he said. The cases for the certificates are made of Taiwan bamboo and are designed to look like doors, he said. They bear the inscription "Door to Outstanding Achievements," which implies that the prize carries people forward into the future, Huang said. A circular gold shape on the door panels, which "locks" the doors, symbolizes the splendor of the prize, like the radiance of the sun, he said. Huang, director of the Taipei-based Fontana Design, received NT$1 million (US$33,194) for his winning design. A total of 245 entries were submitted by Taiwanese students and professionals in the design competition, which selected 15 finalists. The materials used in the designs by the finalists included bronze, bamboo, metal and wood, according to the Tang Prize Foundation. The winners were selected by a panel of judges from Taiwan, Japan, Hong Kong and Singapore. The Tang Prize, inspired by the Nobel Prize and established in December 2012, seeks to honor top international researchers in the four categories.